Origin and Habitat: Northern Cape, Western Cape, Eastern Cape: Great and Little Karoo; Free State. Republic of South Africa. Habitat Duvalia caespitosa grows on arid Karoo and semi-Karoo habitats, in rocky areas which receive mostly summer rainfall, amongst stones and in the cracks between large boulders, often shaded by scrub or grass. Duvalia hirtella var. minor N.E.Br. Duvalia hirtella var. obscura N.E.Br. Duvalia reclinata var. angulata N.E.Br. Duvalia reclinata var. bifida N.E.Br. 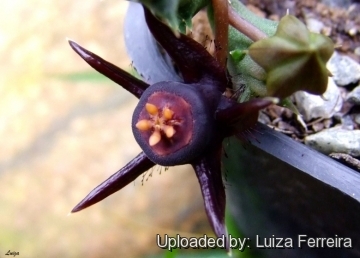 Stapelia tuberculata hort. ex Haw. Duvalia elegans var. namaquana N.E.Br. Duvalia pubescens var. major N.E.Br. Stapeliads S. Africa Madagascar 1: 79 2005. 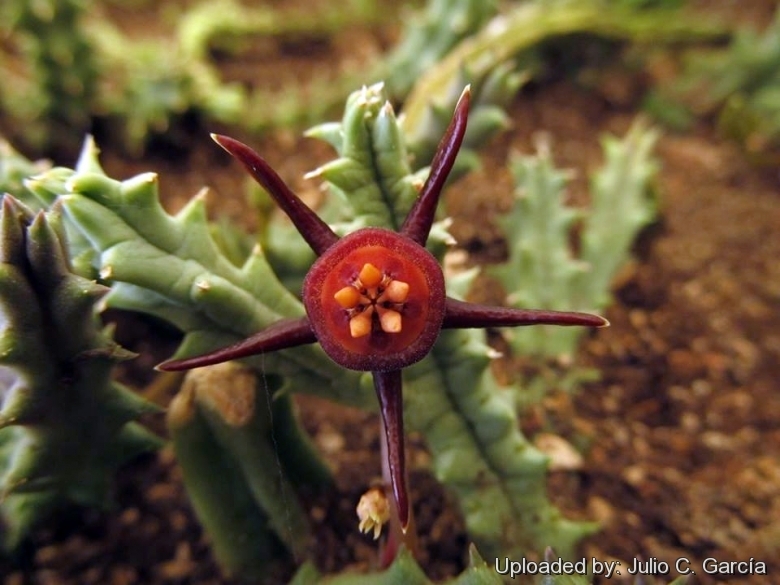 Description: Duvalia caespitosa is a Stapelia-like plant with characteristic star shaped flowers with five fleshy, narrow 'petals'. The species is extremely variable and forms a complex ( The several synonyms refers to previously described species, so similar and intermingled that it is almost impossible to name them accurately without knowing where they come from.) It is not surprising to have caused so much difficulty, because you can find plants with slightly different characteristics growing cheek by jowl in many parts of the areal. 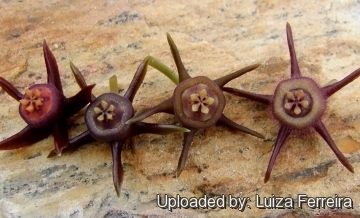 The species can easily be divided into 2 varieties by morphological characters: the nominate form (in summer-rainfall areas and transitional regions) and Duvalia caespitosa var. compacta (restricted to winter-rainfall areas of the Western Cape). Whatever they are called they are all lovely plants meriting a place in any succulent collection. 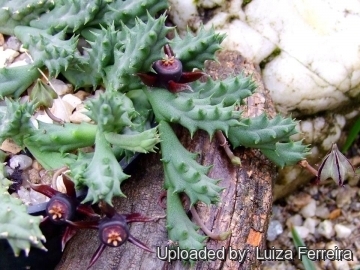 Habit: It is a small, perennial succulent with stems which creep along the ground. The plant branches much at the base to form low clumps or compact mats. Stems: 1,5 to13 cm long 10-22 mm in diameter, 4- to 5- angled, ovoid to cylindrical, dull blue-green to pinkish, slightly toothed, densely crowded and leafless. Leaves: Rudimentary about 2 mm long. Inflorescence: 1 to several flowered from the middle or base of young growth, pedicels 1-2,5 cm long. 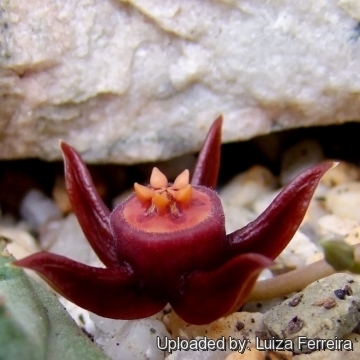 Flowers: Star shaped with five fleshy, narrow petal-like lobes. Sepals 2 - 6 mm long. Corolla about 2-3,5 cm in diameter, greenish,(pale) maroon, chocolate-brown, brownish-purple to dark purple, glossy, with strong foetid smell, variously compared to mature blue cheese, rotten meat, smelly socks and the like. The smell of carrion attracts flies which are known to attempt to lay their eggs on the flowers and in doing so, pollinate them. Corolla lobes 9-15 mm long, 6-9 mm broad, lamina reflexed, margins basally or entirely hairy, hairs very short-ciliate or clavate. Annulus fleshy, raised, circular to pentagonal, sometimes constricted basally, 7- 11 mm in diameter, 2-5 mm high, often spotted, papillate or with minute hairs. Corona yellow to (reddish-) brown, disc circular to pentagonal, 5-7 mm in diameter. Corona-lobes 1,5-2,2 long, 1,5-2,5 mm broad. Pollinia 0,35-0-5 mm long 0,23-0,3 mm across. 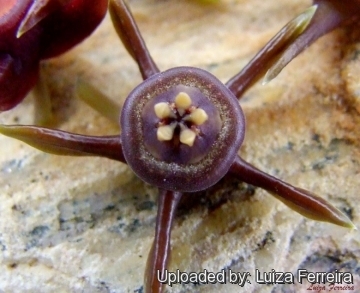 Fruits: Seed pods (follicles) 6-17 cm long, decorative, appearing as twin horns up to a year after flowering. Seeds: 4-6 long by 3 mm in width. Duvalia caespitosa (Masson) Haw. : has purple-brown star shaped flowers with five fleshy, narrow 'petals'. It is extremely variable and forms a complex. Distribution: Northern, Western and Eastern Cape(summer rainfall areas). Duvalia caespitosa var. compacta (Haw.) Meve: has smaller stems and flowers. Distribution: Northern Cape, Western Cape, Eastern Cape: Namaqualand, Great Karoo. Duvalia caespitosa subs. 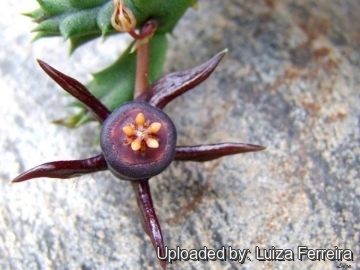 pubescens (N.E.Br.) Bruyns: has pubescent corolla surface. Distribution: Southern Namibia, RSA(Northern Cape. Western Cape)north of the Olifants (winter rainfall areas). Duvalia reclinata (Masson) Haw. : not readily distinguishable from the type, if not for the geographical provenance. Distribution: Cape Province, Central regions and in the coast region near Ladismith. 8) Bruyns, P.V. 2005. 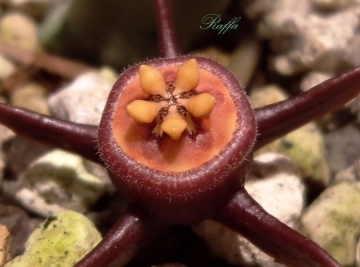 “Stapeliads of southern Africa and Madagascar.” Vol. II. Umdaus Press, Hatfield. 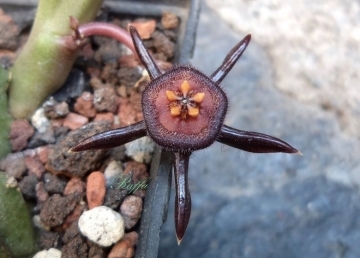 Cultivation and Propagation: Duvalia caespitosa is an easy obliging blooming plant when mature, that it is happy in any average succulent house. Potting: Since roots are quite shallow, use a soft and incoherent cactus mix or add extra perlite or pumice to regular soil potting soil, and clay pots help the plants to dry out between watering. Waterings: Duvalia require moderately watering through the growing season but enjoy plenty of water and some fertiliser in hot weather, this helps them to flower freely. Water more sparingly in winter according to temperatures. But, as with most asclepiads, it is unwise to leave them wet in cold weather. Fertilization: Fertilizers for succulent plants must be rich in potassium, but poor in nitrogen, to avoid the plants from developing excess vegetation, which is easily attacked by fungal diseases. Sun Exposure: As with many succulents, they prefer to grow in the light shade of scrubby shrubs or between rocks where they get some shade during the day. In summer it is advisable to position this plant in a partially shady place, where it is exposed to direct sunlight only during the coolest hours of the day. Hardiness: These plants don't like cold weather, therefore in the Spring it is best to set them outside only when the temperatures are above 15°C. Can endure temperatures below 5°C for short period, but only if the soil stays completely dry. Pest and diseases: Duvalia species vary in their susceptibility to rotting, but are generally fairly easy to grow, especially if kept pest-free. They are very susceptible to stem and root mealy bugs, and damage from these may well initiate fungal attack. If you do have problems with a stem or with basal rotting, you can reliably isolate the healthy parts, dry them off, and re-root them in moist compost. Cultural Practices: Re-pot every 2 years. Propagation: Easiest with stem cuttings. Allow cuttings to dry a day before planting. Stems must be laid (Not buried) on gritty compost and will then root from the underside of the stems. It can also be increased from seeds sowing in spring in moist, sandy peat moss. Barely cover seeds. Seeds germinate quickly.